Is there anything more Alaskaney than Creek Street in Ketchikan. Nope. Today we embark on a new series about Southeast Alaska cruise destinations. These are the most popular Ports of Call in the region, so you will want to know what to see and do when you get there. As a real Alaskan who lives in the state year-round, I am the perfect source for this information because I’ve spent a lot of time in all of these places. Today we focus on Ketchikan. When you walk around Ketchikan, you will see all sorts of fish-related art. Man, those Ketchikanadians sure love fishing. I love fishing too, so I love Ketchikan. I went to the sushi restaurant downtown and they had ono sashimi. That was the moment I fell in love. I’ve also been fishing there a bunch of times and caught salmon, halibut, rockfish, and lingcod. If Ketchikan is one of your Southeast Alaska cruise destinations, you should go fishing. So what is there to do in Ketchikan besides fishing? Who cares? Haha, just joshing. 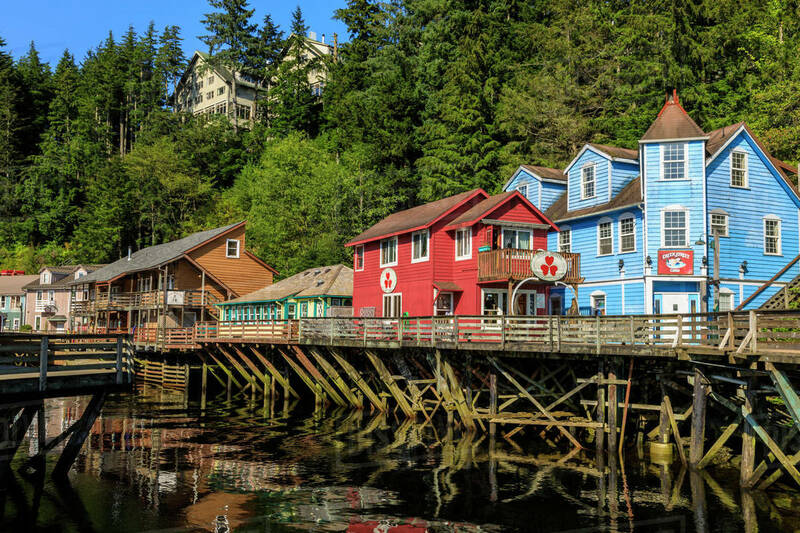 There are all sorts of fun and exciting things to do in Ketchikan. Some of them are free and others cost money. You get to choose, which is pretty exciting. If you like free, I recommend a trip to Totem Park and a stroll around picturesque Creek Street. Nothing looks more Alaskan than Creek Street. Totem Park is super cool and it’s a good place for a picnic. If you have a few C-notes burning a hole in your pocket, you can check out the lumberjack show. The show features a bunch of burly Alaskan men doing magic tricks with logs. Well, it looks like magic to me. You can also do a tour through the rainforest looking at plants and such. There is a great ziplining tour in Ketchikan if you’re into that sort of thing. Like I said, if Ketchikan is one of your Southeast Alaska cruise destinations, you should really think about fishing while you’re there. You can fish right off the bridge next to Creek street if the salmon are running. What could be better than that? If you charter a boat, you could go fishing for ocean salmon and halibut. That would be one of the best experiences of your life. I catch so many fish when I go to Ketchikan that my arm is sore for days. Sometimes when I’m fishing in Ketchikan, I see orcas and humpback whales and all sorts of other sea critters. That’s some big-time Alaska right there! You should also go to that sushi place and try the ono. Ono is a fish called “wahoo,” and it was named wahoo because when you taste it you say, “WAHOO!” No joke. We hope you enjoy this romp related to Southeast Alaska cruise destinations. Ketchikan is a great town full of interesting people and great fishing. What more could you want?